Chai Friday is an lovely event occurring each month throughout the school year that is hosted by the Briar Hill Parent Community. Chai, tea, coffee and yummy home-made treats are made available for purchase, so bring your pocket money. This is a great chance to catch up with others and welcome in the weekend. Enjoy a warming chai, beautiful surrounds and good company. Briar Hill Primary school values and fosters a strong sense of community in order to provide students with a well- rounded education. We encourage strong relationships between families, teachers and parents, who work together to support students to learn with confidence, joy and enthusiasm. Through events such as Chai Friday we hope to foster a positive community surrounding the students and raise funds to contribute to the school. 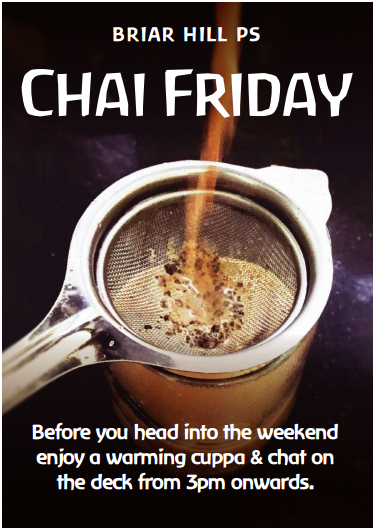 Chai Friday will be running monthly. Chai Friday is operated on a roster system, with each class having a turn to coordinate the event. It involves brewing chai / hot drinks, organising parents to bake afternoon tea offerings, serving and cleaning up. When it is your class’s turn, your class carer will coordinate the Chai Friday team and send information through about the procedure. Funds raised go towards the school. It is a favourite event for parents and children alike. Mark the dates in your diary! Make sure you make a note of when your class is on duty.